Yesterday was a pretty momentous day, not only for Ava but also for me. 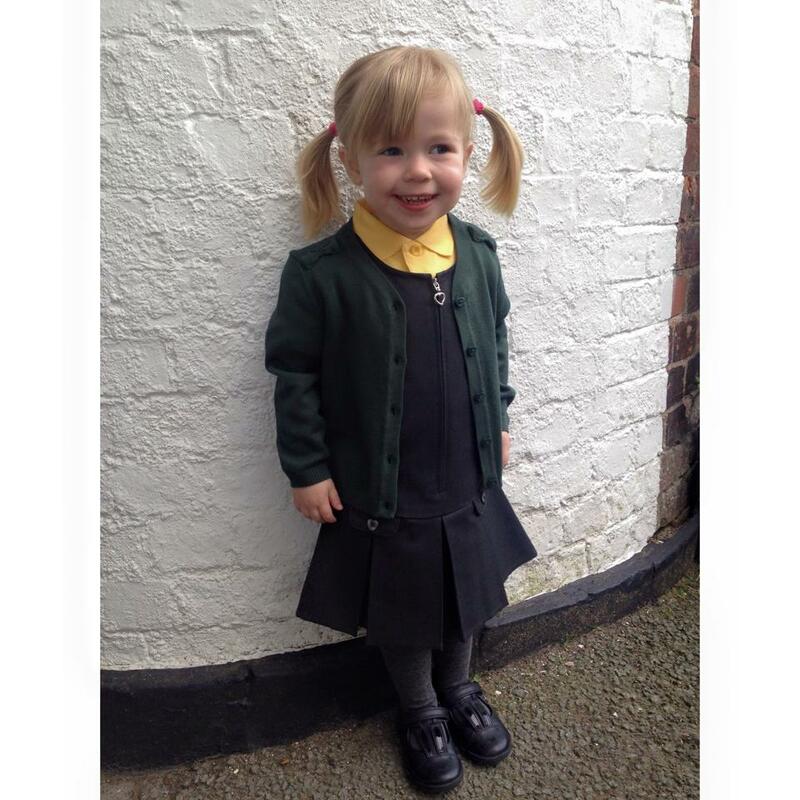 She tried on her new school uniform, as on Tuesday, she starts her new pre-school. I'm so anxious about it but I know it's the right thing to do, I've mentioned in my vlogs that our new house (which we've STILL not moved into) is 4 doors up from her new school and she will be automatically go on to the primary school there, so it will be an easy transition. I finally managed to pick up the green cardigan and grey knee-high socks to complete her uniform, I had no idea it was so hard to pick up uniform pieces in ages 2-3 (Ava's very diddy), and with her brand new Clarks on her feet she was set. She was so excited to try it all on and asked me to put her hair in pig tails. When I saw her looking so grown up I felt such a swell of pride but I must admit that I did have a little cry and poured over her old baby photos when she'd gone to bed. I still can't believe she isn't a baby anymore, I look at her and realise that she is growing and changing every day & those baby days are long gone. Having a 2 month old nephew has brought it home to me even more. Those days seem as though they were light years ago but when I look back at photographs I remember how anxious I was as a first time mother, those soft newborn cuddles and the dozy feeling after a sleepless night. I feel so proud that we're now here, we've arrived at this next chapter but this is the part where I learn to let go a little. I can already picture her little face on Tuesday, so shy and unsure, clutching my hand but I know she'll soon be running ahead of me, eager to get in and play with her new friends. This new chapter feels so huge and I keep thinking that she's not ready for it but I know in my heart that she's 100% ready for this, it's me whose not ready for her to grow up. Why does it go so fast? Is there a right time to have another baby?